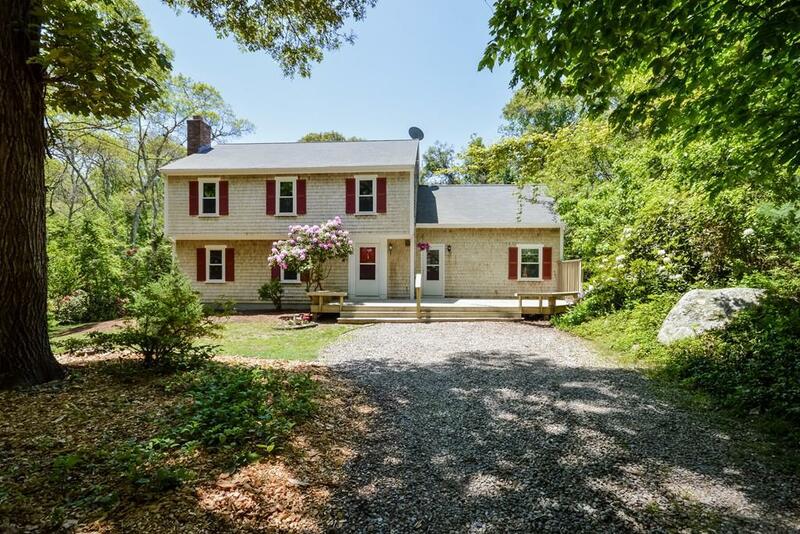 Fabulous Quissett Colonial sited on nearly 3/4 of an acre of land on private dead end street. This property abuts Oyster Pond Environmental Trust with maintained trails down to Oyster Pond, Spohr Gardens and Surf Drive Beaches beyond! The first floor includes the upgraded kitchen with dual sliders to the wrap around decks, the living room with fireplace and the south-facing sunlit family room/studio. This wonderful addition features it's own private entrance, cathedral ceilings, built-ins, wood stove, and wet bar. The 4 bedrooms are located on the second floor. The master suite has its own private bath and overlooks the idyllic wooded backyard. Recent upgrades include a newer roof, HVAC system, and windows. Also new kitchen appliances, carpets, interior paint, and upgraded bathrooms. Listing courtesy of Joshua Burton of Rand Atlantic, Inc.. Listing provided courtesy of Joshua Burton of Rand Atlantic, Inc..